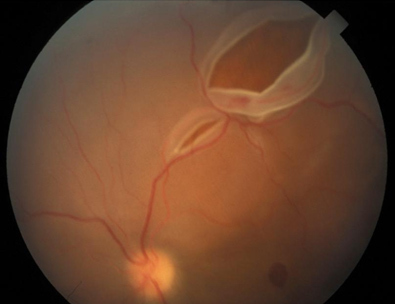 ILLUSTRATION: This is a photograph of the most common type of retinal detachment (RD), a rhegmatogenous RD, caused by liquefied vitreous passing through a retinal tear and causing separation of the sensory retina from the underlying retinal pigment epithelium. The detached overlying retina is opacified and has been likened to that of a billowing, white sheet. DISCUSSION: RDs are painless and often occur after trauma or a posterior vitreous detachment. They are also more common in myopic eyes with increased axial length and often are associated with a vitreous detachment. Any patient with these symptoms deserves immediate evaluation because of the threat of serious visual loss. Floaters are caused by shadows cast on the retina by vitrous opacities including: blood, glial cells torn from the disc, or clumps of collagen fibers. Flashes are caused by vitreoretinal traction (tugging on the retina stimulates firing of photoreceptors). A curtain or veil is caused by the RD itself as the area of detached retina is nonfunctioning. The type of procedure used to repair detachments, depends upon the number, size, and locations of the RDs. However, the goal is to reattach the retina as soon as possible to prevent fluid from seeping under and detaching the macula. Macula- off RDs have a worse prognosis. Of note, patients with RD in one eye have an increased risk of RD in the fellow eye; the earlier the detection, the better the prognosis. AM Acad Ophtho Basic and Clinical Science Series. Section 12, Retina and Vitreous, 2008-2009, pp 277-293.